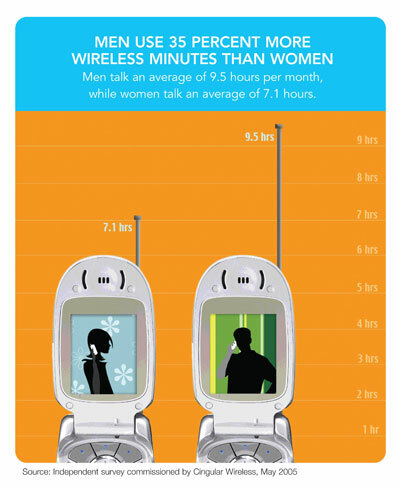 In Cingular's fifth annual wireless usage surgey, men once again lead in the number of minutes used. This year men talk 35% more, more than double the 16% figure from last year's survey. bq. Despite common misconceptions men do communicate, or at least attempt to, using an average of 571 minutes a month, compared to an average of 424 wireless minutes a month for women. While men lead wireless, women still lead home phone usage: 491 versus 321 minutes. Other findings of the survey include: * 82% of women use their wireless phones to talk to friends and family, versus only 62 percent of men. * Convenience (62%) is the top reason for wireless phone usage while safety (19%) is second. * 25% of women have a camera phone, while 21% of men do. And 60% of women use their camera feature frequently or occasionally with only 40% of men using as often.